HARARE — Zimbabwe’s President Emmerson Mnangagwa on Thursday addressed his first campaign rally after surviving an explosion at a rally he was addressing late last month. 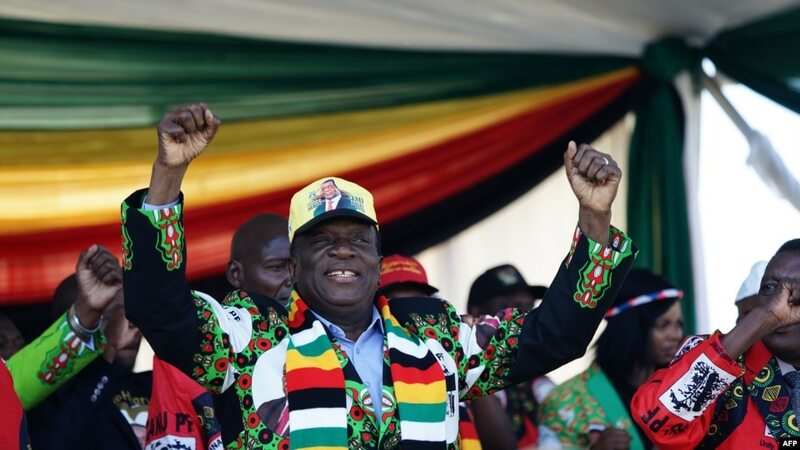 FILE – Zimbabwe’s President Emmerson Mnangagwa addresses a rally in Bulawayo, June 23, 2018. Mnangagwa on Thursday addressed his first campaign rally after surviving an explosion at a rally late last month. Youths and students are singing along to President Emmerson Mnangagwa’s favorite song — “The Hero Has Arrived” — as he walks to the podium to address them. The 75-year-old said he was the only candidate with the country’s future in mind among those 23 vying for Zimbabwe’s top job on July 30. Zimbabwe’s President Emmerson Mnangagwa addressing his first campaign rally in Harare on July 5, 2018 after surviving an explosion at a rally he was addressing late last month. Inviting observers, especially from Western countries, was a departure from Mnangagwa’s predecessor. Robert Mugabe — whose nearly four decades at the helm ended last November after his resignation prompted by military pressure – would say western observers were biased against his ruling ZANU-PF party. But the opposition has argued that inviting observers will not result in a credible election. It is accusing Mnangagwa’s ZANU-PF party of working with the Zimbabwe Electoral Commission to rig the July 30 general election by withholding the voters roll to add the name of deceased persons. 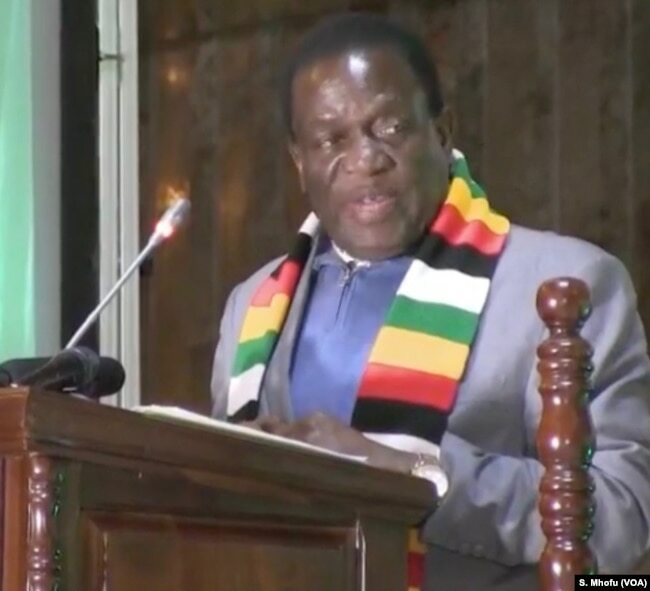 At the rally Thursday, Mnangagwa did not refer to the incident about a blast that went off at the rally he was addressing last month in Bulawayo about 450 kilometers southwest of Harare. 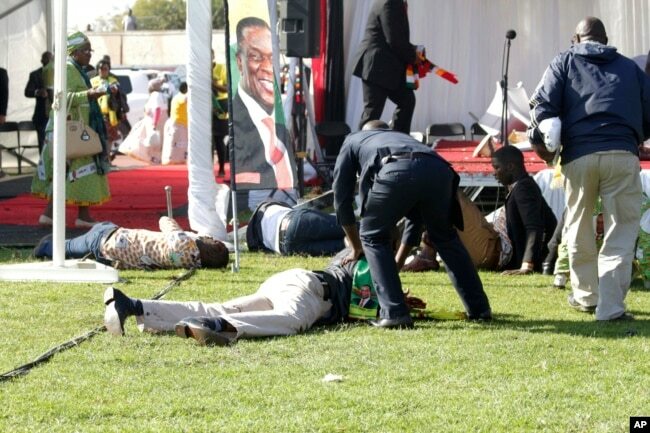 FILE – Injured people lay on the ground following an explosion at a ZANU-PF rally in Bulawayo, June, 23, 2018. Political commentator Rejoice Ngwenya explains why Mnangagwa was mum about the incident, which killed two people and injured about 50 more, including one of his vice presidents. “It is a simple strategy. If you pretend nothing happened; you downplay its meaning, connotation and its depth. So he is deliberately downplaying it so that he doesn’t focus attention on his threats and weaknesses. He would rather focus his attention on his strengths. He is presenting himself not as a cry baby but as a hard-core guy who has gone through these experiences and who just wanted to pretend it is not serious,” said Ngwenya. For a man affectionately known as “The Crocodile,” that probably suits his description. In the general election due in three weeks, Mnangagwa locks horns with 40-year-old Nelson Chamisa, the leader of the Movement for Democratic Change Alliance — a coalition of opposition parties, among other 21 presidential aspirants. 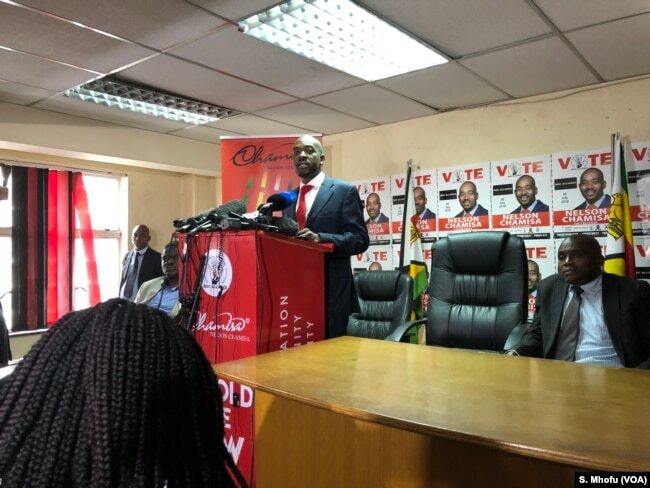 Nelson Chamisa the leader of the Movement for Democratic Change Alliance addressing reporters, July 4, 2018.